There are now reason for Saudi Arabia Netrepreneurs to be happy. Now there are ways to accept payments through PayPal. There are only restriction, payments received will not be immediately available for withdrawal. PayPal owner needs to wait for 1 month holding period. This is a protection made by PayPal due to increasing chargeback incidents as well as increasing credit card fraud. 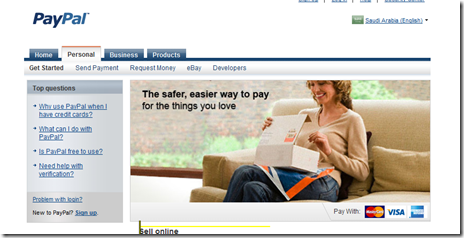 However if PayPal found that a PayPal owner have good merchant transaction they could lift the 1 month holding period. Bank Transfers is still not available. Withdrawal could only be made through VISA Credit Card. So if any of my subscribers is in Saudi Arabia and want to start making money online, better get your VISA Credit Cards. I have been trying to earn online for last two years… “Click to Pay sites”. I have my balance pending and now i have moved to Saudia (Dammam) for last one year (From Pak.). How can I get my payment to be transferred to paypal/alert pay accounts? I have to deposit some fee in Paypal, but being “Kharji” and Azad Visa, It’s difficult to have bank account/credit cards etc. Any Paypal office in Dammam? or Alert pay? Or there is no option except to pay through credit card? Dexter thank you so much for the information I am also a blogger here in Saudi Arabia, particularly in Dammam, all of my transaction were made by my partner in the Philippines. I have my own paypal account but my information was limited. The information you have provided aided me a lot. Thank you so much and GOD BLESS YOU.